Cheverus sophomore Victoria Bossong broke two SMAA junior division records on Saturday morning. Despite a 7am meet start Bossong wasn't fazed as she took .02 off teammate Emma Gallant's league record of 7.43 in the 55m dash. She followed that effort up later in the meet with a scorching 25.83 in the 200m to break the 26.05 previous record of Gallant. The time in the 200m is the top time in the state this winter and move her up to the sixth fastest time in state history in the event. Scarborough's Emily Labbe broke the league record in the Sr 55m hurdles as she blew away the field clocking 8.59 to surpass the eight year old record of Sarah Perkins. Labbe would also add in a victory in the Sr 200m clocking a seasonal best 27.04. 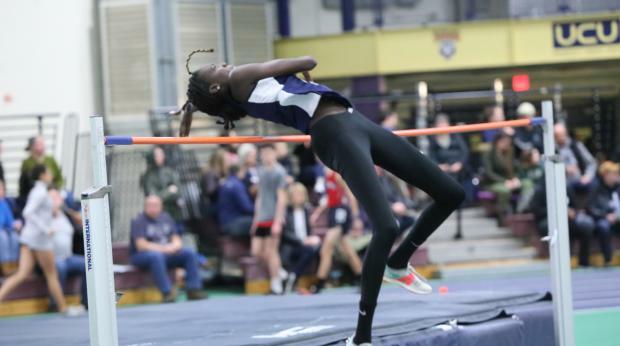 Nyagoa Bayak of Westbrook also got on the record breaking train as she upped her own record of 5'8 to 5'10 1/2 in the high jump. The mark broke her own state all-time best on the event of 5-10 set at the Dartmouth Relays in January. The senior had a couple of strong attempts at 6'0 coming up just short. Her mark ranks her third in the country in the event. She added a second win in the triple jump with an effort of 36-6 3/4 to hold off a string challenge from Emma White of Cheverus 36-4. The duo rank #1 & #2 in the state in the triple. Not to be overlooked in the high jump was Portland's Jaidyn Appel who leaped a personal best 5-6 to finsih second. Her mark is tied 6th best in indoor state history. Hannah D'Orso of Kennebunk ran an excellent 1:32.63 to win the 600yd race, her time is the second fastest in the SMAA this year. While freshman Megan Randall of Scarborough ran the 7th best 2 mile on the year with her 11:48.01 effort. Standout Jarett Flaker posted a pair of wins taking the 55m in 6.61, then running 50.64 to cruise to victory in the 400m. He also added a win on the winning open 4x200m relay as he had a strong 22.4 opening leg. Cheverus sprinter Sean Tompkins clocked the 4th best 200m time in the state with his 23.48 winning effort, he also ran a lifetime best 6.66 in the 55m finishing second. Tristram Coffin of Scarborough ran a state leading 2 mile of 9:39.43 to lower his personal best by 21 seconds, his mark broke the Red Storm school record of two time Class A state indoor champion Jacob Terry. His teammate Noah Drapeau ran the fourth fastest 800m in the state with his 2:02.26 winning effort. Josh Bradford of Falmouth won against a strong shot put field with his 48-3 1/4 toss. While freshman Frank Morang of Cheverus jumped 19-9 3/4 to take the junior long jump. 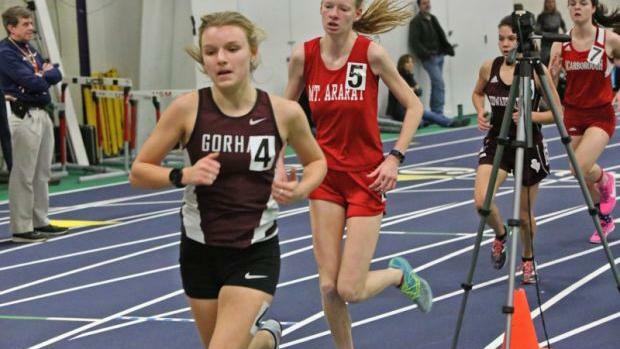 Gorham junior distance standout Kate Tugman set a new personal best & Rams school record with her state leading 11:08.25 winning effort in the two mile. Her effort is a top 30 effort nationally and moves her up to 8th fastest in Maine history indoors. Marshwood posted a win in the 4x200m in a strong effort of 1:51.99 the third best effort in the state, Gorham clocked 1:53.65 to move to fifth in the state in the event. Thornton Academy's Mia Taranko posted a Class A leading 17-3 3/4 to win the long jump. While Katelyn Smith of Windham jumped 34-5 3/4 to move up to fifth in Class A in the triple jump. Tia Snyder of Thornton Academy cleared 9-8 to win the pole vault. Freshman sprint sensation Andrew Farr grabbed a pair of victories with a 53.19 effort in the junior 400m, then running 23.53 in the 200m the to record the sixth best mark in Class A.
Thornton Academy senior throwing star Jason Montano continued his dominance in the shot put with a 60-10 winning effort. Teammate Travis Snyder won the pole vault with a 15-0 clearance and added a second win with a 19-3 1/4 leap in the long jump. Bonny Eagle's Zach Allocca recorded a win in the triple jump with a leap of 41-1 3/4. While Deering's Alec Troxell dominated the mile field with a 4:29.75 state leading time. Max Spaulding of TA was a double winner taking the sr 55m hurdles in a time of 8.29 then winning the 400m in a time of 53.12. His teammate Landon Heidrich clocked a seasonal best 2:03.08 to win the 800m in the fourth fastest time in Class A this winter.